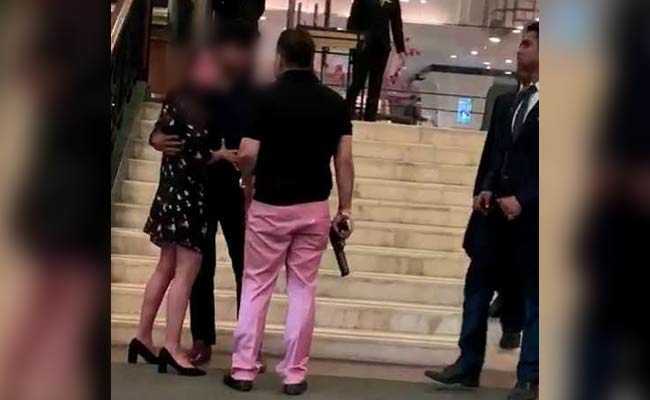 A politician's son wanted by the police after being caught on camera flashing his gun at a five-star hotel in Delhi, repeatedly threatened to kill a young man and his woman friend, says a police complaint. Ashish Pandey, the son of a former parliamentarian of the Bahujan Samaj Party (BSP) has been missing since he was seen in a mobile video waving a gun, abusing and threatening a woman at the Hyatt Regency on Sunday. The police believe he is in Uttar Pradesh. He was seen with his gun as he hurled abuses at the woman. He and his friends were seen driving away in a BMW, stopped neither by the hotel staff or security. The police acted when a video went viral online, provoking public outrage at the venal display of VIP arrogance. The man he threatened, Kanwar Gaurav Singh, has given a detailed statement on what happened that day. The row began when Gaurav Singh accompanied his woman friend to the ladies' restroom. A group of women entered and a fight started. Gaurav Singh has said when he and his friend were leaving, the group was waiting for them. They were with four men. "Then one man in pink pants walked to me and showed me his gun and said I will kill you," says his statement. Later, he says, "this man got out of his car, showed me his gun and said I will kill you, I am from Lucknow. I requested not to shoot or fight. The girls started showing finger to my friend and my friend also showed her finger back at them." Gaurav Singh says he feels scared for his life and so didn't go to the police. "...I don't want my family threatened. I have a small child. I am scared for my life. Please provide me protection and acknowledge my complaint," he says. He said, "This man in pink pants (had a) short beard...his friends called him by the name of Ashish...If there is a need to identify him I can identify him."